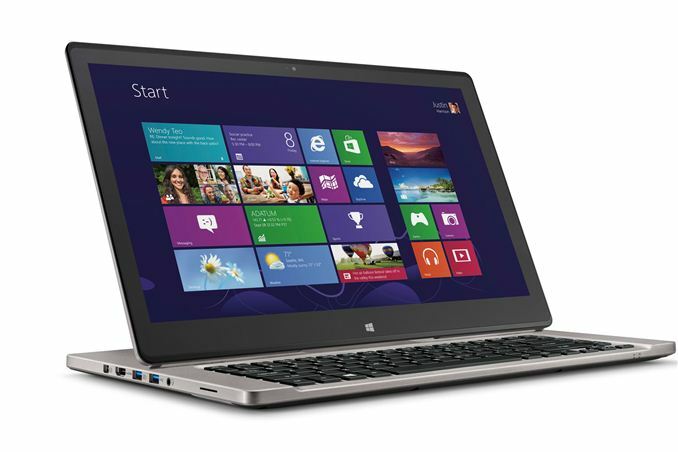 Several months ago, Acer released the Aspire R7, a new and interesting take on touchscreen laptops. We didn’t have an opportunity to review it at the time of launch, but Acer did ship one out a bit later and it’s an interesting enough laptop that we wanted to discuss some of what might make this laptop appealing to a subset of our readers. We’ll start with the customary specifications table, and after you see the specs you’ll hopefully begin to understand why we aren’t going to do a super in-depth review. If we were to have looked at the R7 when it first launched three months ago, it might have made a bit more sense, but with the Haswell processors now launched and relatively available, Ivy Bridge is definitely showing its age. What’s more, none of the other specifications really stand out as being marquee features… except for the display and its so-called “Ezel hinge”. We’ll get to that in a moment, but let’s first quickly touch on the other specifications. The R7 comes with 4GB of memory soldered onto the motherboard and a single SO-DIMM slot. There’s only one model of R7 currently available now, at least in the US (and this is not likely to change for this generation), and Acer populates the SO-DIMM slot with a 2GB DIMM. Storage duties are handled by a 500GB hard drive with a 24GB solid state drive as a caching drive; unfortunately, Acer uses Condusiv’s ExpressCache as opposed to Intel’s Rapid Storage Technology, so in my experience the boost from the SSD cache isn’t as noticeable. Still, it’s better than relying purely on HDD storage. Considering the size of the R7, the lack of an optical drive and somewhat small battery are also going to raise a few question marks. The model we’re looking at uses a Core i5-3317U processor, with its associated HD 4000 iGPU. There was apparently a model overseas that had a GT 750M dGPU as well, but either it never made it to the US or it’s no longer available. It’s a bit of a shame, as having more potent graphics would have opened the door for additional use cases like gaming, and the touchscreen might have proved useful in some games (though the number of premiere games that are built with touchscreen support is amazingly limited right now). Connectivity options are pretty much par for the course, though perhaps a little bit limited for a 15.6-inch notebook. You get two USB 3.0 ports and a single USB 2.0 port, HDMI and VGA outputs, a combination headphone/microphone headset jack, and an SD card reader. That’s pretty much everything I use on a regular basis, with nothing extra. Note that there is not Ethernet, which is an unfortunate omission considering the size of this notebook. The wireless solution is at least decent, with both 2.4GHz and 5GHz radios and connection speeds up to 300Mbps, but the lack of 802.11ac means real-world transfer speeds will never be more than about 20-25MB/s. The specs are a bit underwhelming, but if you really like the design it’s possible to upgrade to the memory to 12GB with an 8GB SO-DIMM, and you can swap out the 24GB mSATA SSD caching drive for a full SSD, plus the chassis supports a standard 2.5” drive as well. You could try upgrading the WiFi as well, but many OEMs lock down the supported WiFi cards so that may not work. The only major drawback to upgrading is that you’ll have to open the bottom of the laptop, which isn’t too bad if not for one thing. You need a T-9 Torx screwdriver, and then you need to pry up two of the rubber pads to get to the last three screws. The rubber pads use an adhesive, so after prying them up you may find that they don’t stay put as well. Other than the three hidden screws, it’s pretty simple to get inside the R7, and the bottom of the chassis comes off with no difficulty. As a final note, this is definitely a hefty notebook, weighing 5.3 pounds without any particularly demanding hardware. In fact, I’ve seen gaming laptops with 15.6-inch displays that have quad-core processors and discrete GPUs that weigh this much. The reason for the bulk probably has a lot to do with the Ezel hinge, though I have to say that as far as Acer products are concerned, this is possibly the most solid feeling laptop I’ve ever seen from them. There’s no flex, creaking, or any other indication that this laptop might fall apart in a couple years. And with that said, let’s move on to the crux of this review: a discussion of the Ezel hinge and the various operating modes of the Acer R7. Need to compare apples to apples here. OSX has a relatively small market share compared to windows 7/8. Desktop PCs running full operating systems are declining across the board for a number of reasons. Windows RT/surface has been a disaster so far for microsoft vs iOS/IPAD which has been very successfull. Android tablets are catching up quickly to IPAD in sales. Microsoft is trying to create a more unified experience across desktop/laptop/tablet/phone though still early on in the process. Apple and android don't have anything that really competes against a full Windows 8 tablet but the public has shown that the market for these devices may be limited or the public is just plain confused now about what these devices do. Time will tell.